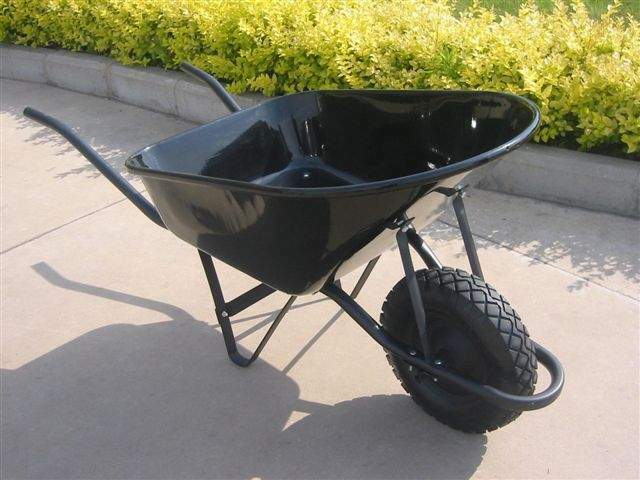 Features: Heavy-duty wheel barrow with 6 cu. ft. capacity (6cu.ft. of sand or 100kgs of water),16” x 4.00 – 8, 2 ply pneumatic tire with inner tube, 1 mm thick steel tray with rolled edge and red powder coating, steel tubular handles of 32 mm (diameter) x 1.2 mm (thickness), Cart Body Size:1420L x 650W x 650H mm, N.W. : 17.5kgs. Packing: 1 set of wheel, hardware, legs and braces packed in each master carton, carton size: 450L x 405W x 190H mm, floor loaded with trays on trays, parts boxes on parts boxes and handles on handles, Loading Quantity: 800 pieces for each 40' Container.